Chicken & rosmarino coated in a mixed herb infused carrot & tomato sauce. Chicken: Place a pan on medium-high heat with a knob of butter. When the butter has melted, add the chicken to the pan and cook for 5 minutes, until lightly golden and cooked through. Use two forks to shred the chicken, then remove from the pan and set aside. Tomato sauce: Using the same pan, on medium-high heat, add a drizzle of olive oil. When hot, add the onions, carrots and celery with a pinch of salt and sauté for 5 minutes before adding the garlic, mixed herbs and tomato paste. Sauté for another 30 seconds, then add the tomatoes (with the liquid) and water (2 cups for 4; 1 cup for 2). Season with salt and pepper and let it simmer (gently boil) for 8-10 minutes until the sauce thickens. 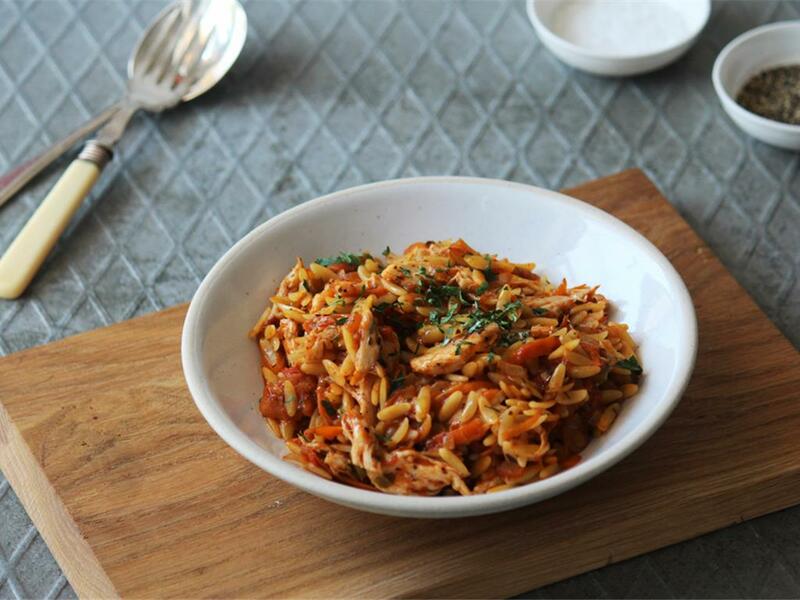 Serve by mixing the chicken and tomato sauce through the rosmarino and sprinkle over the parsley.